Surviving zombie-filled nights is just as important a part of Minecraft as building during the day. When you're working on a major project in Minecraft, nightfall - which heralds the coming of the walking dead - can feel like a distraction. In fact, when you're just a few blocks away from finishing touches your "Citadel of Doom," having to set down your pickaxe and spade and hide away until the dawn comes is an almost intolerable intrusion. 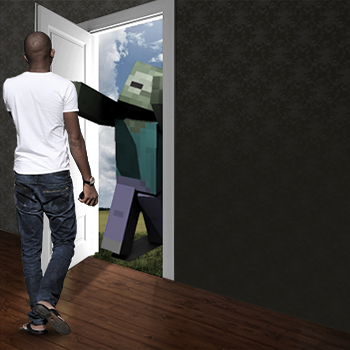 But in Issue 303 of The Escapist, Editor-in-Chief Russ Pitts takes a rather different view, saying that fearing the night is what makes Minecraft's days worthwhile. Surviving Minecraft's night is much more than a part of the game, it is the game. You can fashion a sword from wood, or armor from the hide of cow, but even then you are not invincible. Even then, you may not survive even one encounter with a monster. Even then, your best course of action, your most survivable strategy, is to hide. Tempered by his own experiences with being lost and afraid in the dark, the "fend-for-yourself" nature of Minecraft has struck a chord with Pitts. You can read more about it in his article, "What Purpose, Minecraft Zombies?"